Best Buy is the latest distributer to walk away from Huawei, and, with all the carriers jumping ship, it was also the last major brick-and-mortar location where consumers could actually see a Huawei phone in person. 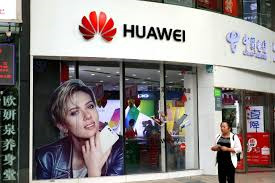 Huawei (is) the largest telecommunications equipment manufacturer in the world (but) despite the ubiquity of Chinese products in the US marketplace, the (Feds) feel Huawei is too connected to the Chinese government, which it says raises "concerns regarding Huawei and Chinese espionage." Here's another nail in the coffin for Huawei's US expansion plans: Best Buy will reportedly stop selling Huawei products over "the next few weeks," according to a new report from CNet. Best Buy is the latest major retail partner to dump Huawei's products after the US Senate and House Intelligence committees targeted Huawei smartphones over spying concerns earlier this year. Huawei was poised to make a big break into the US market this year via deals it had lined up with AT&T and Verizon. Once the Intelligence Committee caught wind of Huawei's plans, it started contacting Huawei's partners and pressuring them to cut ties with the company. Despite the ubiquity of Chinese products in the US marketplace, the committee feels Huawei is a little too connected to the Chinese government, which it says raises "concerns regarding Huawei and Chinese espionage." Huawei's potential for spying has long been a concern of the US government, but those concerns mostly revolved around the company's networking gear. Best Buy is the latest distributer to walk away from Huawei, and, with all the carriers jumping ship, it was also the last major brick-and-mortar location where consumers could actually see a Huawei phone in person. The only places to buy Huawei phones in the US now are Internet retailers like Amazon and Newegg.Huawei happens to be the largest telecommunications equipment manufacturer in the world. While Samsung is the world's largest smartphone manufacturer, Huawei usually settles in around number three and occasionally fights Apple for the number two spot. Huawei is also one of the few smartphone manufacturers with its own line of SoCs, just like Samsung and Apple. ZTE, another Chinese smartphone OEM with close ties to the Chinese government, is often mentioned as an espionage concern alongside Huawei. ZTE has somehow managed to dodge this latest round of pressure and still sells smartphones at Verizon, AT&T, and Best Buy locations.